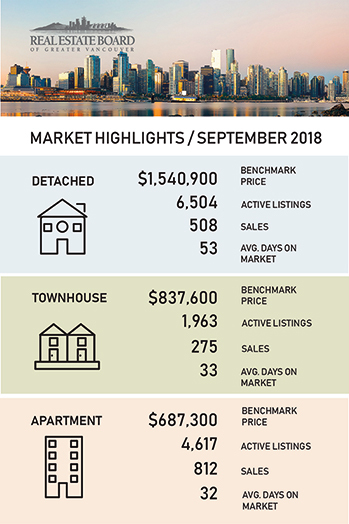 The supply of homes for sale continued to increase across the Metro Vancouver housing market in September while home buyer demand remained below typical levels for this time of year. Last month's sales were 36.1 per cent below the 10-year September sales average. "Fewer home sales are allowing listings to accumulate and prices to ease across the Metro Vancouver housing market," Ashley Smith, REBGV president-elect said. "There's more selection for home buyers to choose from today. Since spring, home listing totals have risen to levels we haven't seen in our market in four years." "Metro Vancouver's housing market has changed pace compared to the last few years. Our townhome and apartment markets are sitting in balanced market territory and our detached home market remains in a clear buyers' market," Smith said. "It's important for both home buyers and sellers to work with their Realtor to understand what these trends means to them."